Recommended Season: April to October. Estimated hiking time: 5 - 7 hours. 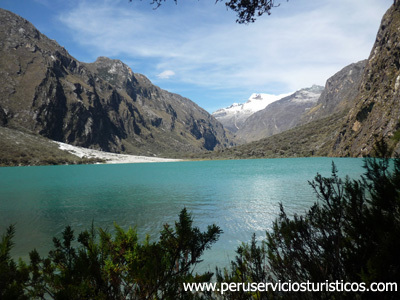 This trek is one of the most famous hiking routes in the Cordillera Blanca, due to its spectacular panoramic views, beautiful lagoons of crystalline clear waters, andean flora and fauna. 6:00 am. Arrival to Huaraz, reception and transfer to hotel. 8:00 am Breakfast at Hotel. Acclimation, free day in Huaraz. 7:00 am. Breakfast at the hotel. 7:30 am. In our private van we pick up you at your hotel in Huaraz, and we will drive to the north side of Huaraz, we pass through the Callejon de Huaylas, where you can observe the typical cities: Carhuaz (2 650 m), Yungay, finally reaching Caraz. From here we leave to Cashapampa (2,900 m). 10:00 am. Arrival to Cashapampa, we meet our donkey drivers to transport our food and camping materials respectively. We begin our first day of trekking to reach the place called Llamacorral (3,800 m). Dinner and overnight at Llamacorral. 9:00 am. This is our second day of trekking, after breakfast at the camp site we start our trek, passing through the Lagoons of Hatun Cocha and Ichic Cocha. 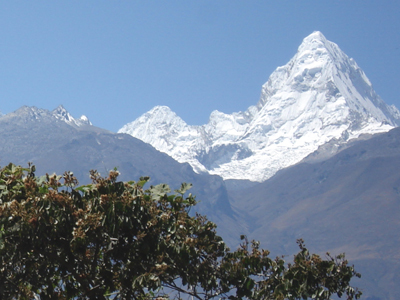 Then we'll have the most spectacular views of snow-capped Alpamayo, Artesonraju and Aguja. We make our way dawn toward we reach Taullipampa, at this place will have our second day of camping. Dinner and overnight at Taullipampa. 8:00 am. After breakfast at camp, we will begin our third day trek, we walk for 2 o 3 hours to the highets point whole trek: Punta Union (4,750 m), we get spectacular views of the mountains, landscapes, lagoons of turquoise waters, blue skies, and fresh air. After taking photos and a short break we walk for three hours and a half to get our third and final day of campsite, Cachinapampa (3,800 m). 8:00 am. This day will be our last breakfast at the campsite, then we walk 2 or 3 hours through Huaripampa valley, Colcabamba and arrive to Vaquería, where our private van will be waiting for us. 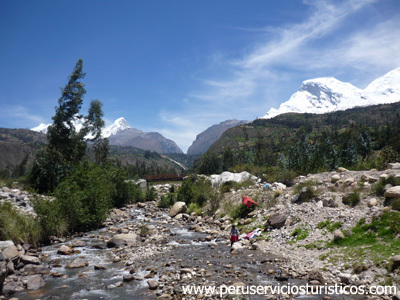 We board the bus and pass by Portachuelo (4.780 m), we will make a short stop to take pictures and have beautiful views of the snow-capped Huascaran, Pisco and Huandoy; a stunning setting where you can see the bottom of the Llanganuco valley and its two famous lagoons of turquoise waters. 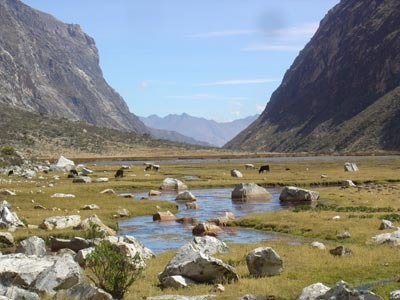 We will continue our way to reach Yurac Coral, we will have lunch there and continue until we reach the city of Huaraz. » Bus ticket: Lima - Huaraz - Lima. » Transfer: bus station - hotel - bus station. 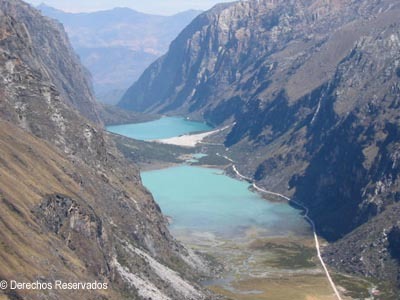 » 1 night hotel in Huaraz and 2 continental breakfasts. » Transportation: Huaraz - Cashapampa, Cebollapampa - Huaraz. » English speaking official guide. » All meals during the trek (vegetarian option). » Dining utensils, chairs and tables. » Donkey and donkey drivers. Aprox. 15 kg per client. » First aid kit & oxygen bottle. » Good food and varied choice, from dried fruits, fresh fruit, rice, meat, pasta, jam, salami, cheese, flakes of oatmeal, milk powder, nuts, bread, mate, coffee, pocorn. Optional for vegetarians. » Sleeping bag (- 14°C). » Dinner and lunch on the 1st day. » Extra Food & Drink. » Sleeping bag . If you do not have one, ask about equipment rentals. » Sunblock, and lip sunscreen. » Camera and / or camcorder. » T-shirt, pants fleece ( jeans are not recommended because they are difficult to dry when they are wet, wool socks, hats or caps, shirts, short and long. great for the neck scarf, coat and waterproof jacket with hood hiking boots or appropriate shoes for walking, gloves. Large scarf to the neck, hiking shoes, gloves. » Personal clothing and toiletries.